A classic fall-run Situk River steelhead. Historically, you could find steelhead in streams up and down the west coast of the North America from Southern California to the Alaska Peninsula, but these days healthy populations of wild steelhead are harder to find. Most steelhead are now found in the northern portion of their range, in the more remote areas of British Columbia and Alaska. 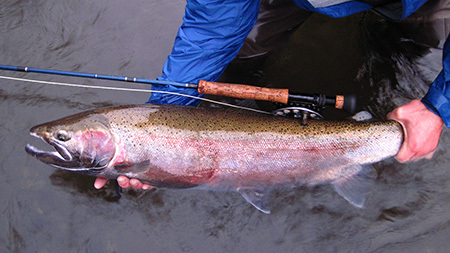 So those are the facts, but anyone who has been lucky enough to tangle with a wild steelhead will likely describe them differently… They are smart and elusive fish, tucked into wild and inhospitable waters. 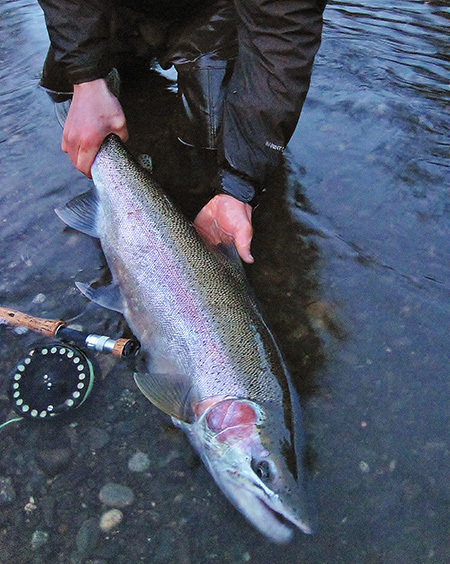 Often, just finding a steelhead is an accomplishment in and of itself. But when presented with a well-placed lure or fly, steelhead can become voracious predators, striking, then fighting with a recklessness that turns the whole experience into something approaching chaos. The remarkable strength and ferocity of well hooked steelhead, tearing line wildly off the reel with freight train runs up and down the river, is an experience that is burned into the memory of a fortunate few. With steelhead populations spread broadly across Southeast and Southcentral Alaska, there are many places to pursue these fish in our state. However, most of these populations are very small, consisting of 200 or fewer fish, which, when combined with the remoteness of many steelhead streams and the temperamental weather of the region to make steelhead fishing in Alaska challenging at best. But if you head north out from the inside waters of Southeast Alaska, tracking the wave-battered coastline past the shoulder of Mt. Fairweather and the glacial delta of the Alsek River, you’ll notice a change in topography. The sharp relief and dense forested slopes of the Southeast Alaska archipelago transitions to the broad coastal plain of the Yakutat forelands. This 50-mile stretch of coastline is patterned with pristine old growth spruce and hemlock forests that surround veins of rivers meandering from the mountains to the sea. Among the numerous productive freshwater systems of the Yakutat forelands, the most renowned is the Situk River. Originating from two lakes (Situk Lake and Mountain Lake), the Situk flows approximately 18 miles, joining with several streams in a tidal estuary before exiting directly into the Gulf of Alaska. From its headwater lakes to the ocean, the Situk drops approximately 500 meters (nearly 1,650 feet) in elevation, creating slow meandering riffles and pools that provide excellent spawning and rearing habitat for anadromous and resident fish species. The stable, diverse, and productive aquatic habitats of the Situk watershed make it one of the most productive rivers of its size in Alaska. The Situk is home to significant populations of all five North American Pacific salmon species, Dolly Varden, rainbow trout, eulachon, also known as hooligan, and most remarkably, the largest known population of steelhead in Alaska. The Situk offers many miles of accessible fishing locations to the angler willing to hike. The acknowledged ecological and economic value of this fishery led to formalized assessment methods conducted by the Alaska Department of Fish and Game (ADF&G) beginning in 1988. The ADF&G weir on the lower Situk uses an underwater camera to count and sample post-spawn steelhead as they emigrate back out to sea. Over the past 10 years, an average of over 6,000 steelhead were counted at the weir, with a high count of over 15,000 occurring in 2006. The steelhead sport fishery on the Situk River is the largest in the region, on average over sixty percent of the steelhead caught in Southeast Alaska are caught on the Situk. While sport fish regulations in Southeast Alaska allow for the annual harvest of two steelhead, 36 inches or longer in length, the harvest of Situk steelhead has dropped to nearly zero in recent years as anglers have voluntarily adopted catch-and-release fishing practices. But the Situk isn’t a great place to catch steelhead just because there are a lot of steelhead, it is also a uniquely accessible river. Daily jet service from Juneau or Anchorage makes it surprisingly easy to get to the remote coastal village of Yakutat, and several lodges and bed and breakfast operations cater specifically to steelhead anglers each spring. Once you’ve made it to Yakutat, the relatively small size of the Situk and miles of trails along the upper and lower sections of river allow it to be fished very effectively by wading anglers, especially those willing to put in some miles. For those who prefer fishing from a boat, the U.S. Forest Service (USFS) maintained launch ramp at 9-Mile bridge is the starting point for a 13-mile float down the river to the lower Situk landing pull out. This full day float gives anglers access to miles and miles of premium fishable waters, including stretches difficult to reach on foot. Many anglers choose to utilize the services of local guides from lodges or independent operations, this is great way to get a crash course on Situk steelhead but is certainly not necessary to find fish. The Situk is also an ideal destination for the DIY angler, many of whom prefer to camp near the river to maximize time on the water. 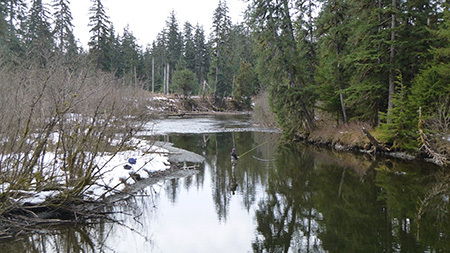 The USFS tent platforms at 9-mile bridge are perfect for getting you out of the moss and under some cover, but there are numerous places for anglers on foot or floating the river to camp as the Situk falls completely within the Tongass National Forest. There are also three USFS public use cabins in the Situk River watershed, two of which are located about 2 miles downstream from 9-mile bridge, which can be accessed by boat, foot, or plane. The third cabin is on Situk Lake which is about a 3.5-mile hike from the Situk Lake trailhead, possibly longer depending on the snow conditions of the roads in early spring. These popular cabins book up well in advance of steelhead season but can provide welcomed shelter and warmth from the unforgiving weather of the spring and fall seasons in Southeast Alaska. A fish that won’t be soon forgotten. Having spent nearly 15 seasons on the Situk, I am most struck by the connection many anglers have developed to this river and its fish. It’s not uncommon to strike up a gravel bar conversation with someone who has been fishing the Situk for 30 years or more. It is a place where parents bring their kids and grown-ups bring their parents. These connections are fostered by the uncommon opportunities the Yakutat area and the Situk provide to all anglers. A chance to step away from the hustle of daily life, to climb into waders in the predawn darkness, to ready the boat or strategize on which section of the river to hike, and to go find a fish that you will remember forever. The Situk and its fish provide this opportunity because complex biological systems of forest, river, and ocean come together to produce and sustain a population of steelhead that is as wild and healthy as the ecosystem around them. To protect this opportunity anglers must be stewards of the fish and of the place, we must prioritize careful conservation of the steelhead population and of the watershed that supports it. During my time on the Situk I’ve seen the effects of thousands of anglers visiting this river each year, littered trails and campsites, stream bank erosion, giant tangles of fishing line and gear in river. These impacts combine to degrade the health of the ecosystem itself, as well as the experience anglers have on the river. We must also remember that this area is the ancestral home of the local Native community and that the Situk River literally provides the food locals depend on to live. So, when you do finally visit the Situk I hope you’ll bring feelings of respect and responsibility to match the excitement we all feel when the opportunity to catch a wild steelhead draws near. Remember to tread lightly, the gravel you’re stepping on may hold the eggs of the fish you’ll hope to catch in a few years. Remember to pack out what you pack in, to skip a few grip and grin pictures and keep ‘em wet as much as you can, to use only single hooks, and never use bait. These are a few of the easy things all visitors to the Situk can do to help ensure we can all continue to connect to this wild place and these wild fish. Matt Catterson is the Division of Sport Fish Management Biologist for the Yakutat area. Having spent years pursuing steelhead recreationally and professionally across Northern Southeast Alaska, he is happy to chat with anyone considering a steelhead trip to the Yakutat Area or beyond.